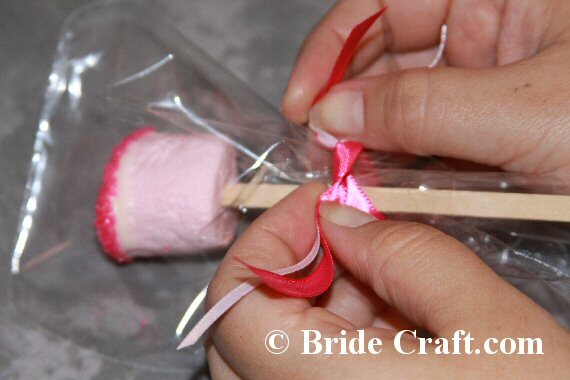 DIY Delicious Marshmallow Pop Favors! 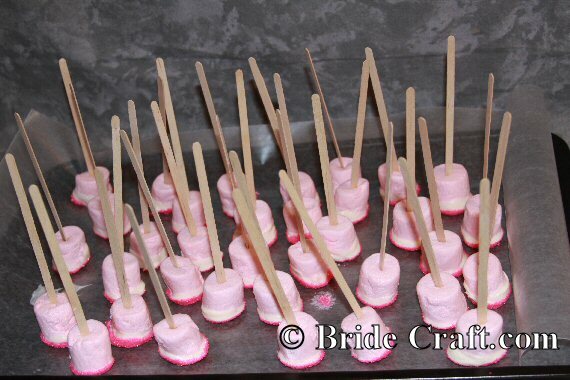 Considering sweet marshmallow pop favors for your wedding favors or sweets table? Not sure if this is affordable or easy? Great news, it's both! 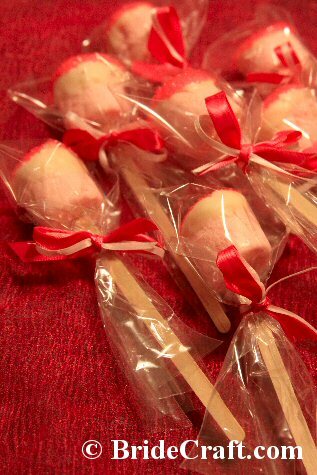 These super simple treats are sure to be a hit with guests, and your pocket book. Pros: Easy and affordable. This project can be done up to two weeks in advance and refrigerated. And it's fairly customizable, with marshmallows being available in several colors, as well as the dipping chocolate. And the sky is the limit with ribbon accents or charms! Cons: It can be a little messy, and can take up a lot of space. And even though it's inexpensive and simple, it can be time consuming. 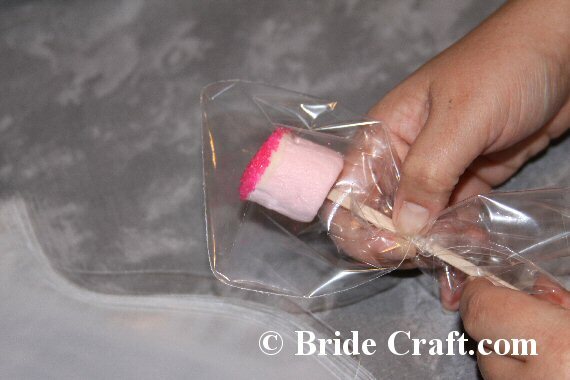 Keep that in mind, Bride Crafters! Step 1: You will need melting chocolate (optional food coloring if you are tinting the chocolate), marshmallows, sugar sprinkles or your sprinkles of choice, a microwave safe bowl, a cookie sheet or large platter (not pictured), wax paper( not pictured), skewers or popsicle sticks, a small bowl or container, small plastic favor bags, your choice of ribbons and scissors (not pictured). Step 2: Follow the directions on the chocolate and melt down to a creamy consistency. 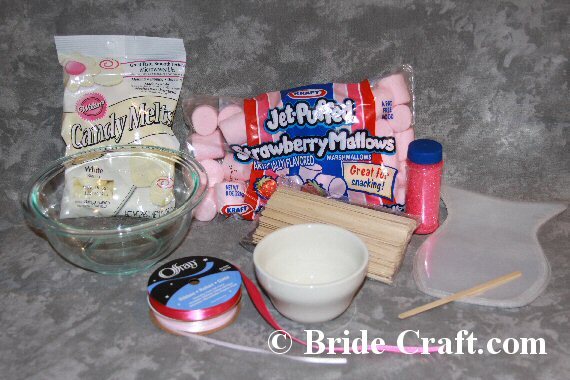 Proceed to skewer a marshmallow with the stick or skewer. 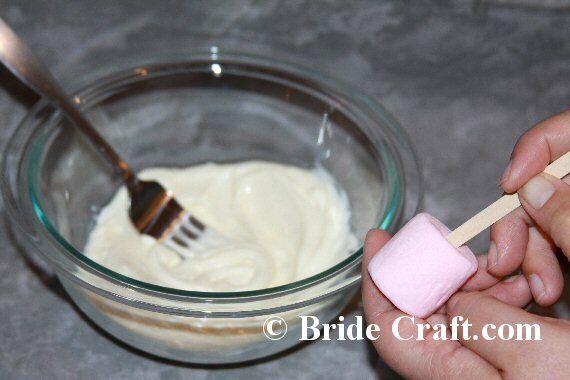 Step 3: Dip and spin the marshmallow pop favor into the chocolate. When you are satisfied with the coating of chocolate, you can stop. In advance of this step, prepare the small bowl with your sprinkles. 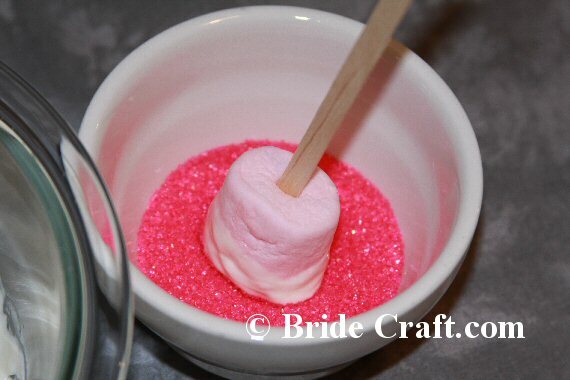 Step 4: Dip your chocolate coated marshmallow into the sprinkles. 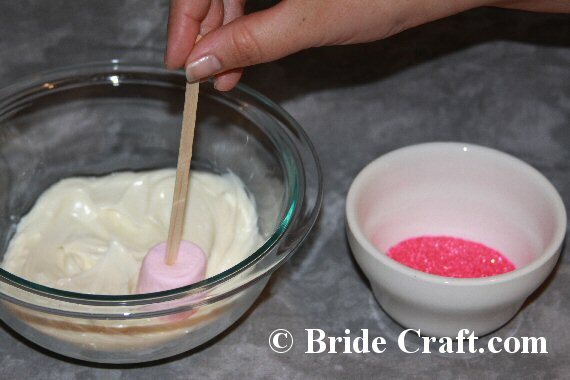 Tip: This is a great way to add your colors into your DIY wedding favors! This project pop boasts light pink, white and hot pink. What are your colors? How can you incorporate them into this tasty treat? Step 5: After the pops have been chocolate and sprinkle dipped, rest them on a wax paper lined tray, like shown in the photo above. Step 6: Repeat steps 1 through 5 with enthusiasm! Make sure that your pops are neatly spaced out and do not touch, as they may be difficult to pull apart later. Pop them into the fridge to set and chill for a bit! Step 7: Take a chilled pop and slip it into an appropriately sized plastic favor bag, like so. Step 8: Measure and cut a length of ribbon to tie off your favor. If you are satisfied with the length, measure and cut the rest of the ribbons so that they will be reasonably similar to the first. Step 9: And ta-da! 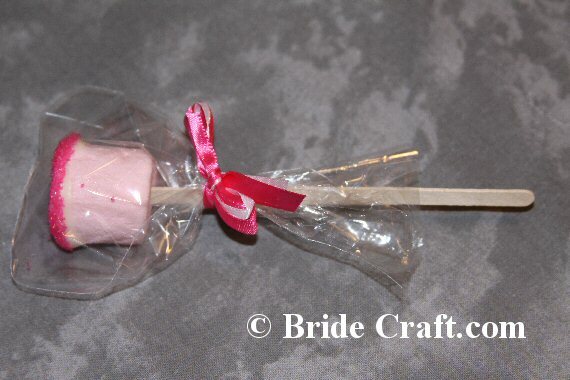 Your first marshmallow pop favor is completed. How simple was that? Make as many as needed and store wrapped in additional plastic in the fridge. 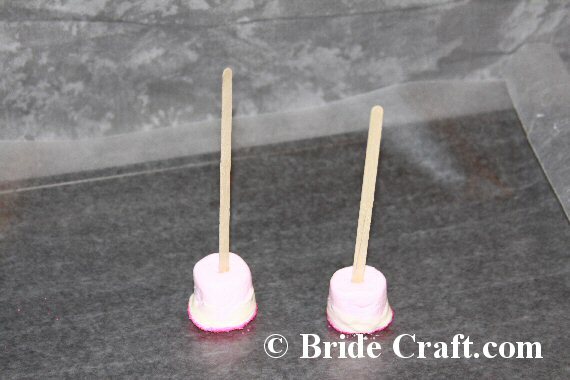 Return Marshmallow Pop Favor to DIY Wedding Favors.